The first two phases of local polls, with their high turnout of 60-80% in six provinces were essentially a referendum on elections – reflecting the strong desire among Nepalis to vote for local governments. This will put pressure on the ruling coalition, opposition and the Madhes-based RJPN alliance to get Province 2 to go for voting soon. Prime Minister Sher Bahadur Deuba, who is often blamed for sabotaging democracy by calling off parliamentary and local elections during his second tenure, has taken one step toward redeeming his past. But it ain’t over until Deuba successfully holds local polls in the eight Tarai districts of Province 2, and provincial and parliamentary elections soon after. There isn’t much time left. The constitution requires the existing Constituent Assembly-turned legislature to be replaced by a new federal Parliament before 21 January 2018. But some constituencies will be snowbound by November, and then there are the Dasain, Tihar Chhat festivals before that – leaving a narrow window for two big elections. The constitution has envisioned three levels of elections to be conducted in ascending order, or even simultaneously. This is because representatives of local and provincial councils will form the Electoral College that elects the Upper House of the federal Parliament. Ex-Chief Election Commissioner Neel Kantha Uprety argues that provincial and parliamentary elections can be held simultaneously during October (see Guest Editorial). 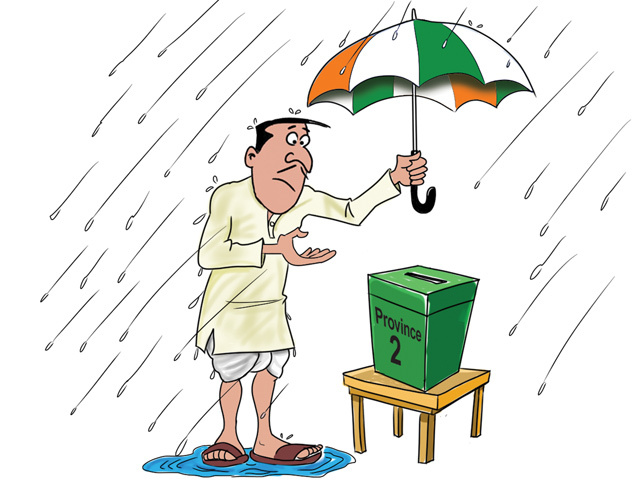 The government needs to form a commission to delineate new constituencies right away and finish its task by the end of monsoon to pave the way for provincial elections. The Election Commission needs to publish a timetable, and stick firmly to it without political interference. All these are huge technical challenges, but even more difficult will be bring the RJPN onboard. Local polls were postponed four times in Province 2 just for them, and they have major issues with provincial boundaries as they stand. The RJPN boycotted the first two phases of local elections, and is threatening to disrupt the remaining elections if their demand for a constitutional amendment is not met. But Madhesi voters turned out in large numbers this week even in the Tarai districts of Province 5, where the RJPN believes it has a hold. Mishra says the high turnout in the plains of Province 5 busted a few myths: the RJPN is the only force in the Tarai, Madhesi people consider the party as their saviour, and have rejected the constitution.